Orthodontic treatment in the pre-teen or early teenager years is the most common treatment we provide. As I'm sure you've noticed, many 5th, 6th, 7th, and 8th graders are in braces or Invisalign. Is there a reason that 'everyone' gets braces or Invisalign at this time? In a word: Yes. Our goal as orthodontists is to align the permanent teeth and correct the jaw position for a proper bite. Generally by the age of 11-13 the deciduous (baby) teeth have all been lost, and the permanent ones have come in, so comprehensive orthodontic treatment can begin. Orthodontic problems don't improve with age. It's simpler and more effective to treat many orthodontic problems during adolescence because the body is still growing rapidly at this time. Whether we use standard braces, Invisalign, or appliances like palatal expanders, we can efficiently create an improved appearance and function. When treatment is done, your smile and bite are benefits that can last your entire life. What can you expect when you come in to our office for treatment? It all depends on what kind of treatment you need. The first time you come in, we evaluate your need for orthodontic treatment. If you are ready for treatment, then we schedule a records appointment to take pictures, radiographs, and a digital scan of your teeth (no more impressions! ), and we schedule a consultation appointment to review the diagnosis and treatment plan with you. 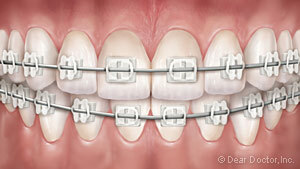 Treatment typically involves metal braces, clear braces, or Invisalign, as you can see below. 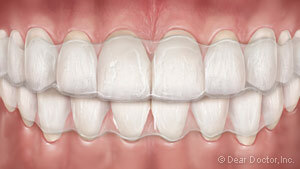 Once braces or Invisalign treatment has begun, adjustment appointments occur at approximately 6-8 week intervals. To learn more about orthodontic treatment please visit our All About page. 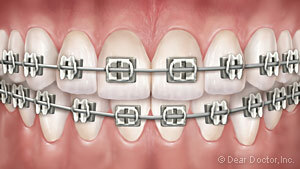 Metal Braces are smaller than ever, yet still come with over 20 colors. Clear Braces feature brackets made of ceramic that blend in with your teeth, making them harder to notice. Invisalign is a series of removable, clear plastic trays that gradually straighten teeth as they're worn (for 22 hours per day). Formerly recommended only for adult patients, they now are appropriate for teens in some situations. The advantage: they're practically invisible! There's no one answer that fits everyone: It all depends on what we need to do in your individual situation. Generally, however, comprehensive orthodontic treatment lasts about 18-24 months. Afterwards, you will wear a retainer so you can enjoy your smile you created for a lifetime.